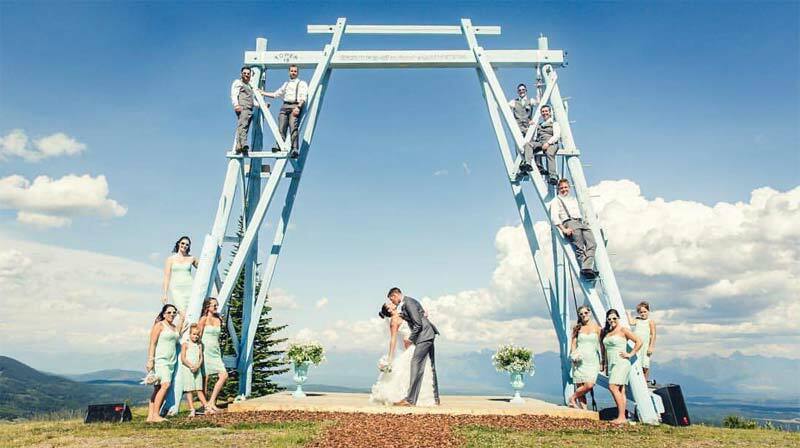 Kimberley Alpine Resort would be honored to host your Mountain Dream Wedding. Imagine whisking your entire wedding party and guests up the Express Chairlift to the top of the North Star Mountain for the ultimate “Mountain Dream Wedding.” Say your vows under the historic Maverick T-Bar arch, built in 1958, this t-bar was considered the longest t-bar in North America with an elevation of 6500 feet. It creates the perfect setting to say your vows any time of the year with breathtaking views of the Rocky Mountain Range. Reception options include the rustic and stylish Stemwinder Bar and Grill that can cater up to 200 guests. For groups of 350 the stunning Kimberley Conference Centre makes every event a glamorous affair with glass walkways, magical lighting and towering windows. 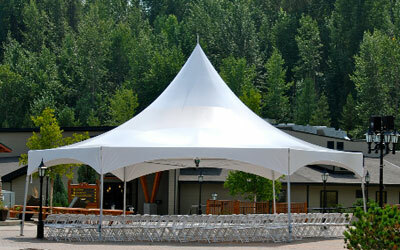 www.meetkimberley.ca If you are looking to celebrate your entire event outdoors under the stars the beautiful skylight tent can seat up to 175 guests and is the perfect venue to host your reception. The beautiful award winning Trickle Creek Golf Course located 3 minutes from the resort village is a wonderful venue to host your wedding rehearsal dinner. The golf course’s natural outdoor setting and magnificent flower baskets offer a romantic place for you and your guests to enjoy. Montana’s Cookhouse located in the Trickle Creek lodge in the center of the resort village is another rehearsal dinner option to consider. Montana's follows the village blueprint for décor; with a plethora of pine log work and etched glass work. "Alex and I have literally not stopped smiling since New Years Eve – it was the BEST day of my life, and I’m sure Alex’s too! Our day could not have been made possible without your help….could it have gone any better? I think not!! Our guests had nothing to say but WOW WOW WOW." Special Wedding Rates for guest accommodations and food & beverage facilities can be arranged for you, whether your event is a large gathering or an intimate wedding. We have outlined some of the options available to help you select your ideal venue. We look forward to hosting your wedding at one of our spectacular venues; please contact our experienced and detailed oriented resort wedding planners for more information. Click here to view the Kimberley Alpine Resort Wedding Rates. Click here to view the Kimberley Alpine Resort Helicopter Wedding Sheet.